Peruvian archaeologists have uncovered the remains of 12 children and 20 llamas sacrificed some 800 years ago by the pre-Incan Chimu civilization. 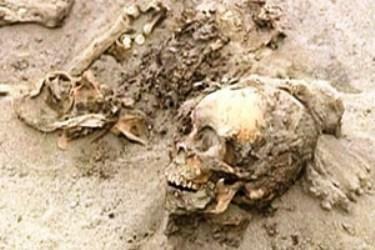 The bodies were discovered in good condition during excavations in the northern coast of the country at Huanchaquito, some 500km from the capital Lima. The bodies were found near the ancient city of Chan Chan, a government and religious centre of the Chimus. Experts believe the children and animals were killed in a ritual similar to the Incan ceremony known as Capacocha, which was organized before the imminent death or birth of an Incan emperor. Archaeologists also suspect the sacrifice could have been done to settle down nature's forces because the remains were found amid clay, suggesting they were buried during a rainy season. Head of the excavations, Gabriel Prieto, said it was unlikely for the site to have been a cemetery. "All these bodies seem to be from the Chimu period, that is, they are associated with Chan Chan and they lived in a time ranging from 1,200 to 1,400 years after Christ," he explained. "And, more than a cemetery, this seems to be an offering - a ritual that these people celebrated probably to honour the sea due to rains. It is also possible that his could have been a Capacocha ritual, which was very common in the Incan time. When an Incan governor lived, was born or died. Great sacrifices were made to honour these events." The remains were found tied with ropes and there were no burial offerings around. Prieto said the animals were strategically buried in relation to the bodies, reinforcing the hypothesis that they were laid to rest during a sacrifice ceremony. Chan Chan was built by the Chimu civilization around 850 AD and is considered a UNESCO World Heritage Site. Peru is a country rich in archaeological treasures. It has hundreds of sites that date back thousands of years and span dozens of cultures, including the Incan empire that was in power when Spanish explorers arrived in the early 1500s.